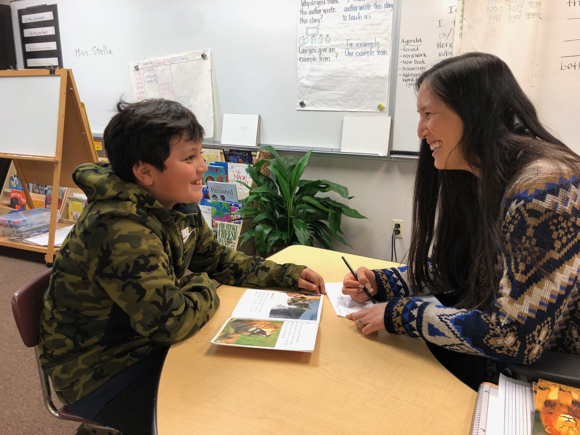 Last year, the Ravenwood Education Foundation launched the literacy intervention program in the Ravenwood School District, which identifies third to fifth grade students reading 1-1.5 years below grade level and provides them with intensive support. Groups of four students cycle through six weeks of four-times-per-week instruction with a literacy Teacher on Special Assignment (TOSA). As a result, in the 2018-2019 school year so far, students with this literacy intervention moved ahead of their peers by 50%. With three, soon to be four, young sons of her own, Kimberly is impressively calm and poised — and quite obviously delights in seeing her students’ progress. One such student is Alex (pictured top), an engaged 4th grader at Willow Oaks, and the youngest of six boys in his family. He admits he used to be bored trying to read and would only occasionally pick up a book. Following a six week cycle of intensive small reading groups with Kimberly in the Fall — and support replicated in the classroom — Alex progressed from a beginning 3rd grade reading level to an end of 4th grade reading level. His new found joy in reading is evident, and he is proud of his progress and the material he can now access. 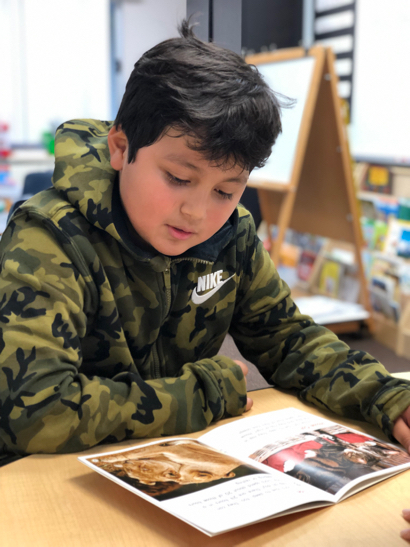 To that end — funding more literacy specialists among other programs — the Ravenswood Education Foundation (REF) is hosting its 12th annual gala on Saturday, March 2, at 6:00 pm at the Four Seasons in East Palo Alto. Tickets are available online through Feb. 26. “Each year, our gala raises a third of our annual program budget,” explains Renu Nanda, Executive Director of the Ravenswood Education Foundation, “so it is a key event where community members come together to celebrate and support the students of Ravenswood schools — and raise vital funds for programs.